The large number and density of retail hotels in many destinations, it makes a poor user experience to plot them all on the map at higher zoom levels. Why is this feature important? Hotwire has many retail hotels available, the hotel pins on the map tend to become overcrowded. My proposal is to test a pin clustering concept to improve map usability. How does this feature benefit customers? Pin clustering will help users navigate the map better, increasing overall map engagement and click through rate to details page. What business opportunities does it create? Overall map engagement will increase. Our customer centric strategy will create consumer trust with our product and convince them to book more. Google has a recommended approach to clustering pins on a map. In this need, I have researched their proposed solution and determine what's needed to implement it. I have proposed to cluster hotel pins on the retail map into groups. Field testing the out of the box solution for pin clustering has yielded some positive feedback. I have determined that this UX pattern would solve our issue of too many pins being displayed at once. This project brought huge impact. Please check my proposal that I presented to the product team. Our customers needed to filter the results by deposit method so that they can see the cars that will be able to rent with their preferred payment method. I have created a flow that allows the users to filter car rentals results based on deposit method (debit or credit card). Giving our users' ability to know when other travelers have rated a Hot Rate Hotel highly would grant confidence in booking without knowing which hotel it is. The desktop team ran a highly successful test (PR +2%) where they added superlatives ("Good, Great, Favorite, Amazing") to the hotel result modules for hotels with customer recommendation scores of 80% or higher. We have replicated this test and anticipate its value at about %70k annually. The challenging part of this project was: Displaying Star Ratings, applying a wisdom word like "Top Rated!" but displaying a weak star rating nearby. Show full stars only, but not the empty ones: Empty stars create confusion and, which looks more like "reviews" with empty stars. Hotel Name and Star rating should be displayed together: The number of stars represents the brand quality. My proposal adds another line of height to the module which may ultimately be inevitable but makes the stakeholders think about testing this with and without the free amenities. iOS has removed them with no negative impact so in keeping with the "everything has to earn its place" philosophy, we decided that this is worth testing. Urgency is a big driver of conversion and it's one of the primary "conversion veins" that we focus on in optimization efforts. The desktop team has gone through a couple of iterations of creating urgency on the car booking page to encourage users to book now rather than wait until later and saw a 1.3% lift in conversion from billing to confirmation. In this story, we I have added urgency messaging to the car booking overview page and run a Leanplum (A/B testing tool) version test to gauge its impact on purchase rate. Giving the users ability to see which Hot Rate Hotels other travelers have rated highest makes them confidently book without knowing which hotel it is. Opaque booking needs confidence. In order to increase this confidence, we needed to give our users a stronger sense of the activity in our app with the number of bookings happened in the last 24 hours. This number is provided in a similar way to our current value/savings message on the details page. It was not possible to specify pick up and drop off locations different. In this project, I worked on the ability to pick up a vehicle rental in one location, and drop it off in another location, depending on availability. 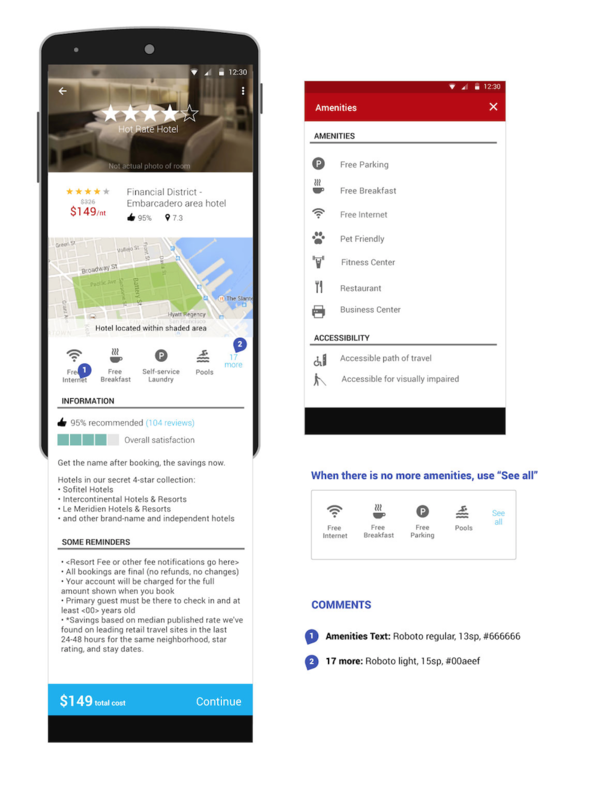 We want to display full text along with amenities icons on the details page since only 9% click on amenities to view full details. Business justification: This will give more information to the user about amenities instead of them guessing what the icons mean. Users did not understand the amenities icons we showed on details pages. Adding full text made the amenities clearer and increase purchase rate.